I just love the color combination from the Basic Grey Scarlet Letter pattern paper. 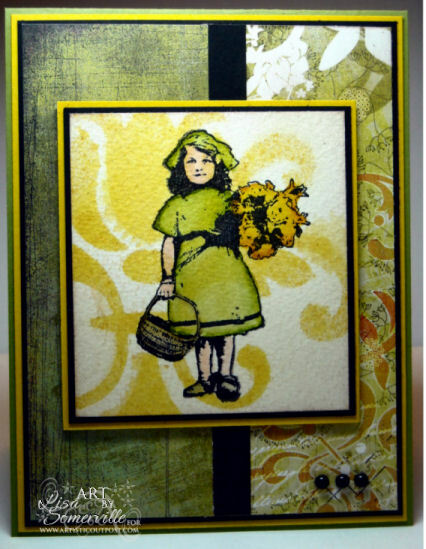 I used the pattern piece as my inspiration when Marker Watercoloring this lovely image from Artistic Outpost. Before stamping my image, I used the Wet Stencil Technique to add the Stencil to the Watercolor paper. Once Dry, I stamped the image in Black Archival, then colored with Markers. Just lovely, and the stencil tech just added the perfect touch! such a bad, bad influence...I love that paper!!!! Not to mention the card is gorgeous! Love your stencil - your card is fabulous!